Joe Gilkerson of Numotion shares about dynamic seating and self propulsion. Joe, tell me a little bit about yourself. How long have you been working in this industry? “I’ve been doing CRT since 1984 and I’ve been in the industry since 1977. 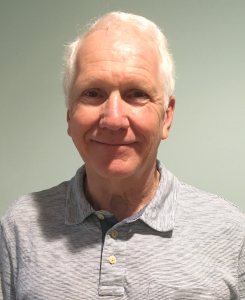 I know nothing else, there is nothing else I can imagine doing that would give me the emotional high that this field does.” Joe went on to describe how he loves to develop relationships with the people he works with. He also stated that he has been using Dynamic Seating for a long time. I understand that you have an interesting Dynamic Story! Joe has worked with Blake since he was a young child. Now 21 years old, this young man started off in a linear seating system and Zippie manual wheelchair in 2005 and again in 2008. He was dependent on caregivers to push the wheelchair. In 2010, he received a Kids Rock dynamic manual wheelchair. “In talking to his Mom and PT and watching Blake, we decided he would benefit from dynamic seating.” Blake was extending in his seat and his team was trying to break up that tone by absorbing and diffusing the force through dynamic seating. Blake also had seizures. Joe recommended dynamic seating to help with the seizures, as well. How does this help? The dynamic seating “allows his body to move, otherwise the seizure activity may get worse. He is also less likely to hurt himself.” Joe often recommends dynamic seating for clients who have seizure activity. Blake has begun to employ self propulsion since incorporating dynamic seating into his chair. Blake did well in the Kids Rock, but eventually this product was discontinued. In 2014, he started using a Quickie IRIS tilt manual wheelchair with a Seating Dynamics Dynamic Rocker Back interface (DRBi), along with another manufacturer’s dynamic footrests and head support hardware. This again met Blake’s needs well. Over time, Joe noticed some functional improvements and thought Blake may be able to self-propel. Joe placed 24” wheels on the IRIS and Blake began to push! Now the IRIS is rather heavy for self propulsion, so Blake eventually ended up using a Quickie 2 this year with a DRBi. 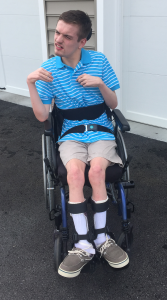 Joe describes Blake’s current self-propulsion – “when he propels, he pushes back into some extension (using the dynamic back), he can then access wheels, relaxes, and the back returning to neutral helps him push the chair.” Blake only needs a 4 point pelvic positioning belt now. He used to have lateral and anterior trunk supports, but as his trunk control improved, he no longer requires these. What differences did you see in Blake’s function over time? Do you have any other thoughts about Dynamic Seating? Thanks for all the work you do Joe! You are truly making a difference in many people’s lives! That is very encouraging, Michelle and Joe. Thanks Ed, and thanks for all the awesome work you do! This was an exciting process with Blake. Gives us another way to think about dynamic technology. I agree, so encouraging. Judy, thanks for your comment! I love hearing other’s experiences using dynamic seating! I always get new ideas!